We�ve always been careful not to change much to the formulas that make our guitars and basses iconic in sound and design. For this, we rarely bring anything new to market. However, this year we just couldn�t resist introducing the W Series of walnut made designs of our traditional 330, 360 and 4003 models. This is a natural spin on our classic models. These walnut Rickenbackers boast the same full, rich and warm sounds that we�re known for, while adding the strength and natural character of walnut polished with an oil finish. The full model lineup for the W Series includes the 330, 330/12, 360, 360/12 and 4003. All are outfitted with Maple necks. The entire line is made from top quality wood to deliver thorough excellence. 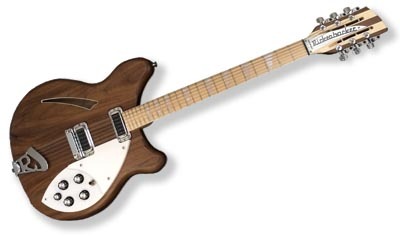 Contact your favorite Authorized Rickenbacker Dealer for price and availability. Order fast as backorders lines may build quickly! A natural spin on a classic, the W Series brings the same full, rich and warm sound that have made 330�s popular since the 1960�s. The iconic design is now strengthened with the natural character of walnut and polished with an oil finish. Two single coil pickups on a full size body are accented by a traditionally shaped sound hole. The 24 fret Maple fingerboard is punctuated by dot inlay fret markers, with full double cutaways permitting access to all the frets. Standard output is monaural through a single jack plate. Also available with twelve strings. This W Series version of the world's most popular twelve string electric guitar offers the same deluxe features of its Model 360 cousin, now with the strength and character of walnut. This fresh spin on a classic comes with a Maple fingerboard and has a natural polished oil finish. A standard for recording for more than thirty years, its haunting, melodic chorus has continued to benefit from evolution. The slimmed and re-contoured neck now makes the 360/12 easier to play than ever.